We have integrated sonarqube scans in our pipeline. 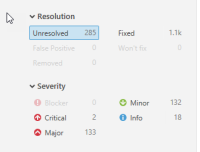 The reporting to the sonarqube backend is done correctly. In addition we use this plugin to write the sonarqube summary to our influxDB. When doing this we found the following data in influxDB . Correct are "time", "Build_number", "display_name", "lines_of_code", "prefix" and "project_name". Just tested this and I can reproduce this with my setup. There is definitely something wrong with the SonarQube integration. Lines of code uses a different API url than the issue search. The fault is most probably there. "time" is a measurement automatically generated by InfluxDB, "build_number", "prefix", "project_name", and "display_name" are sent straight from Jenkins and not from SonarQube, so I would be really amazed if they would be incorrect also. Aleksi Simell added a comment - 2018-01-10 07:11 Just tested this and I can reproduce this with my setup. There is definitely something wrong with the SonarQube integration. Lines of code uses a different API url than the issue search. The fault is most probably there. "time" is a measurement automatically generated by InfluxDB, "build_number", "prefix", "project_name", and "display_name" are sent straight from Jenkins and not from SonarQube, so I would be really amazed if they would be incorrect also. Found that there was a typo in the project key filtering. The REST API call had "projectkeys" instead of "projectKeys", which caused the REST call to return issues from all projects instead of the requested project. Fix will be available in the next release. Aleksi Simell added a comment - 2018-01-10 08:18 Found that there was a typo in the project key filtering. The REST API call had "projectkeys" instead of "projectKeys", which caused the REST call to return issues from all projects instead of the requested project. Fix will be available in the next release. Next week earliest. I have another SonarQube issue I will try to get into the same release (https://issues.jenkins-ci.org/browse/JENKINS-47776). Aleksi Simell added a comment - 2018-01-12 12:59 Next week earliest. I have another SonarQube issue I will try to get into the same release ( https://issues.jenkins-ci.org/browse/JENKINS-47776 ).